Milliblog Weeklies – DEC09.2018 by Milliblog! After 50 weeks, I’m discontinuing Apple Music playlists. Reason: a potential bug that they couldn’t care to help resolve. Result: My 2017 annual playlists are in tatters, mutilated. Across 7 playlists, where I had carefully built each top 30 list, now it has 1-2 songs 🙁 Quite a few people seem to be having this problem with no resolution from Apple – see: 1, 2 and 3, for instance. 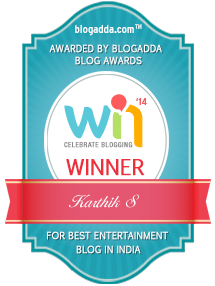 I have written to them officially, tweeted to them, tagged the India editor… no luck. A regular Milliblog reader tried to help and raised an internal bug alert after which I understand that an engineer from Apple told him that the playlists were manually updated on April 29, 2018! And because it was a manual update, they cannot do anything. Eventually, I found that the weekly Apple Music playlist I created on April 29 has no songs now, while the Saavn equivalent has 16 songs. 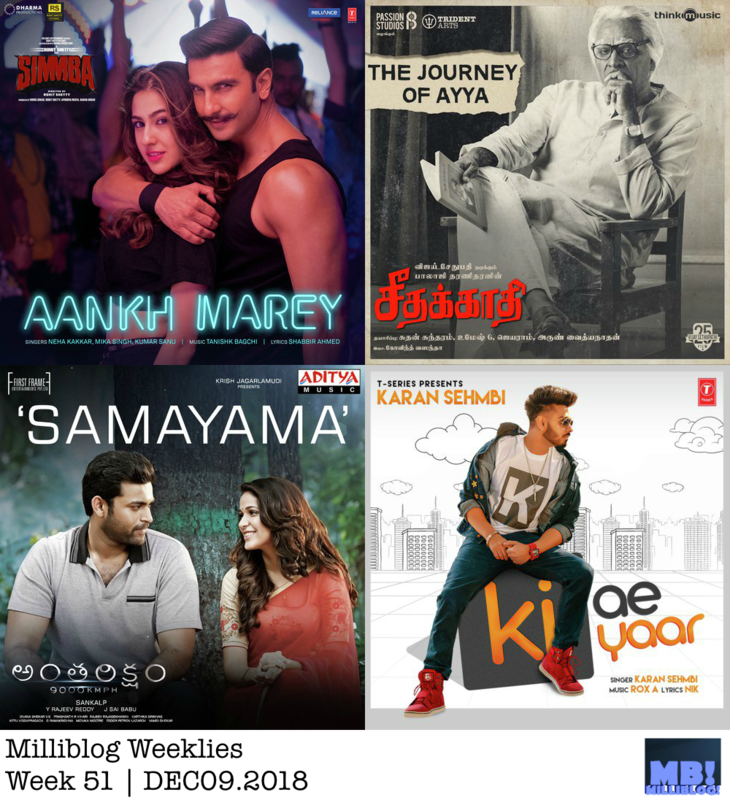 The subsequent playlist on May 6th – on Apple, it has one song, while Saavn has 15 songs! This is a monumental waste of my time. Let me just stick to Saavn—now JioSaavn—and YouTube. Aankh Marey (Simmba, Hindi): As if preempting our annoyance with remixes, Karan Johar opens the song with, ‘Oh no, not another remix’ 🙂 And in an inspired move, Tanishk Bagchi uses Kumar Sanu primarily for the nasal ‘aankh’ word, almost like that running ‘phlegm’ gag! But yes, the dance moves and the revamped tune is a total earworm! Issaqbaazi (Zero, Hindi): A zingy folk song by Ajay-Atul with the requisite amount of modern sounds, almost like blending the Shah Rukh character and the more modern (in-film) Salman cameo. Good vocal sparring between Sukhwinder Singh and Divya Kumar, courtesy Irshad Kamil. The Journey of Ayya (Seethakaathi, Tamil): Govind Vasantha is having a stupendous year – no doubt about that all. If the title song and Avan were brilliant, this one, based on Gowrimanohari raaga, is incredible! The trailer had featured this song’s snatches and I had mentioned how fantastic it sounded. It turns out to be an instrumental and one that literally melts you! Maya Maya (Sarvam Thaala Mayam, Tamil): If the title song sounded great, but not really fitting the Rajeev Menon-A R Rahman combo’s phenomenal past 2 soundtracks, this one surely does. Sung by Chinmayi, the melody flows beautifully in directions that are not predictable or making us feel comfortable. It does require a couple of listens to absorb the flow, but once you get it, the tune works wonderfully; particularly the anupallavi. And Rahman’s music, in the background has a light, ethereal feel! The second interlude, featuring Kamalakar’s flute, is a delight. Ullaallaa (Petta, Tamil): This one fares much better than the first single, Marana Mass, which had everything going for it but not cohesively. The energetic Latin rhythm and the philosophical life-lesson lyrics that Rajini is known for adds to the fun. Samayama (Anthariksham 9000 KMPH, Telugu): Composer Prashanth R. Vihari has been behind some good songs in the past, but in Samayama, it almost feels he has truly made it!! Not only does he get his singers—Harini and Yazin Nizar—to do an outstanding job with singing his immersive melody, but the way to adorns it with Sandilya P’s violin and adds a fantastic tabla-layered anupallavi is absolutely scintillating! Idhem Life Ra (Mithai, Telugu): Vivek Sagar is back! I didn’t like the other song released so far (Liberation), but this one’s comfortably in Vivek zone. Bluegrass’y sound, superb chorus (by Sai, Ishaq and Harsha) and excellent lead vocals by Sravya Kothalanka. Kallolam (Padi Padi Leche Manasu, Telugu): The title song was super. This one too works effortlessly. Vishal Chandrasekhar definitely has a winner here! Anurag Kulkarni’s singing is a particular highlight as much as that ‘Prapanchame Amaanthame’ hook! Thandaane Thandaane (Vinaya Vidheya Rama, Telugu): Typically Devi Sri Prasad’ish song with a basic, largely familiar tune set to sparse, but highly rhythmic sound. It’s left to MLR Kartikeyan to do the best of it! Dhuvun Taak (Mauli, Marathi): Ajay-Atul produce the Marathi equivalent of a kuthu song and what a job they do! Ajay’s singing is his usual ebullient self and the manic speed of the song never falters, keeping us consistently shaking our feet! Ready For My Vyah (Shaadi Anthem) (Raftaar, Deep Kalsi, Akriti Kakar; Punjabi): A simple, but insanely catchy Punjabi song by Deep Kalsi. The ‘Ready For My Vyah’ hook and the persistent musical hook stay with you, quite annoyingly. Ki Ae Yaar (Karan Sehmbi, Punjabi): Rox A’s music offers Karan really long, winding phrases and he handles them wonderfully. The tune has an unusual edge—reminded me of Bhairavi raaga, like in Beetab’s Jab Hum Jawan Honge—that keeps it constantly interesting!